The Scotts absolutely rocked their Snoqualmie Pass Maternity Session! Even though mom was freezing the entire session, you would never know by how stunning she is! The gowns she wore fit like a glove and they accentuated her beautiful skin tone perfectly! One of the reasons I adore this couple is because the father set everything up for them! He emailed me about their maternity and newborn sessions and has done all of the correspondence. I love when fathers are very involved and really value photography because its something that really makes the mother feel special. 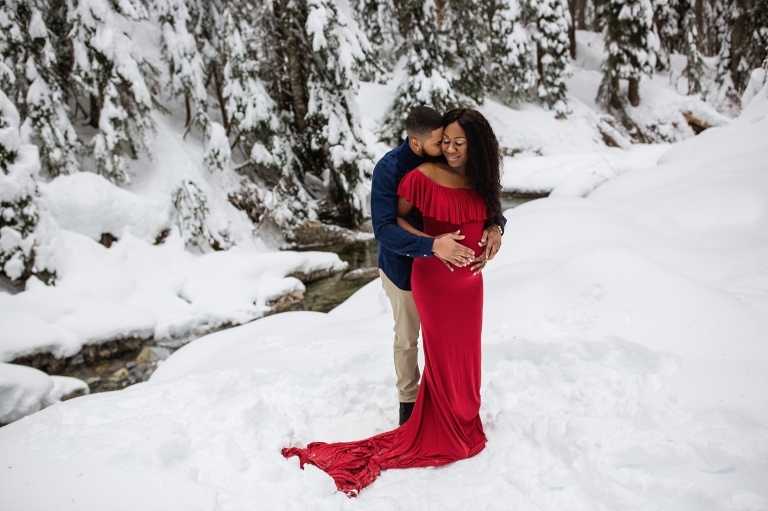 The day of this couple’s snowy maternity session was nothing short of perfection! The snow was fresh and I was able to find the most beautiful spot to photograph at! The trees were poking through the snow and there was a gorgeous stream of water that added to the scenery. I’m really excited for their upcoming newborn session and I can’t wait to see these two again! Christina Mae Photography is a premier Seattle maternity photographer located in Puyallup, Washington. Tina is a newborn, baby, maternity, family and child photographer serving Seattle, Tacoma, Bellevue, Gig Harbor, Puyallup, King and Pierce County.